Living in Los Angeles means being in foodie paradise. Angelenos can choose from a wide range of culinary options, many of which are fuision cuisines. One of the popular local dishes is the ‘breakfast burrito’ – A Mexican-American fusion treat and my personal favorite if I want a hearty breakfast and don’t have much time. Well, I was raised in the Indo kitchen and taught how to improvise and ‘fusion’ is our middle name. Nasi Goreng, for example, is a common breakfast dish in Indonesia, fried rice made of yesterday’s left-overs. Then wrapping food in dough is nothing new to us: lumpia (eggroll), risolles, steamed dumplings, to name a few. So, lo and behold, we have arrived at the Indo Burrito. I added this recipe to my 2nd cookbook published in Holland, titled the new Indo Cuisine. Any Indo food you made the day before can be wrapped and enjoyed. Take your left-over steamed or fried rice and combine it with tempeh, meat, vegetables. Add some garlic chilisauce and some acar (Indo pickles). And shout before you sink your teeth in it: Holy Burrito!! Heat the tortillas in a skillet over low heat, so they are softer and more pliable. Place the tortilla on a large cutting board. Place two to three tablespoons of cooked rice just below the middle. Spread the rice as a kind of bed for the rest of the ingredients, like a meat dish such as babi ketjap or beef rendang meat or a vegetarian option like tempeh goreng. Then another layer of vegetables, such as sambal goreng beans. Now take the lower part of the tortilla and fold over the ingredients. Fold the left and right inwards and roll the tortilla to the top. Cut the tortilla over in half and serve with (atjar) relish, chili garlic sauce or Indo salsa (like sambal matah – get it off the shelf at Trader Joe’s). In Los Angeles eet ik vaak een ‘breakfast’ burrito. Het gerecht behoort tot de Mexicaans-Amerikaanse fusionkeuken. Een pannenkoekje die als een soort envelop wordt gebruikt voor een combinatie van ingrediënten. Verpakken van voedsel in deeg is gebruikelijk in de Indische keuken, zoals bijvoorbeeld loempia en rissoles. De kliekjes van de vorige dag worden vaak opgebakken in een nasi goreng. 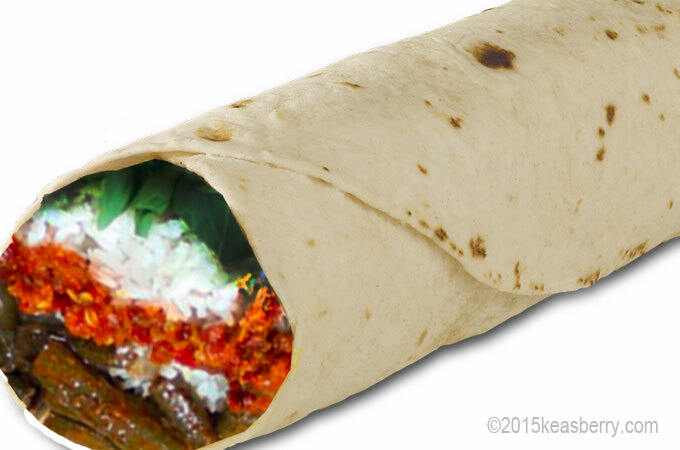 Waarom dus niet de kliekjes verpakken in een burrito deegvel. Neem je overgebleven witte of gebakken rijst en combineer het met sambal goreng tempeh en boontjes? Of iets met vlees, babi ketjap of rendang. Doe er nog wat bladgroenten bij zoals, paksoi of zelfs atjar. Lekker voor thuis of onderweg. Dit recept komt uit mijn 2e kookboek: De nieuwe Indische Keuken – uitgekomen in 2014.